I took this photo on a night dive. I saw the large soft coral, checked it for a candy crab and found one in a good position in a “V” shaped gap in the coral with some clear water behind the subject, depending on the angle taken in the photo. I took a test shot, made some adjustments to my strobes and then took a 2nd shot. The candy crab moved to the other side of the soft coral. I took a few more shots without the crab in the shot to finetune my lighting before moving to the other side of the soft coral and found the crab. I was then able to move the focus point to the crab’s eye and wait patiently for the candy crab to move into the “V” before taking the photo. I was able to take two photos of the subject before moving to the other side and waited patiently between photos to not stress the crab out so it remained around the “V”. 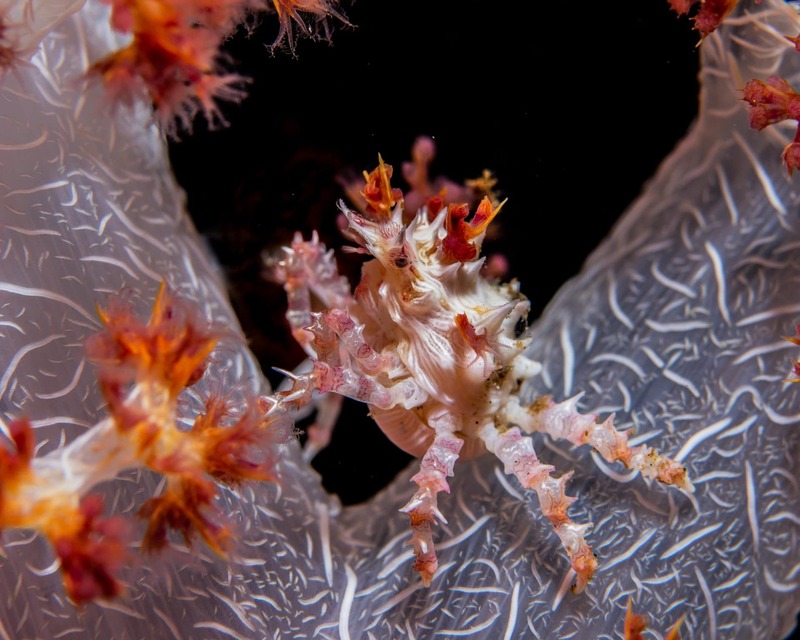 The key to the shot was to get the best angle with the soft coral in the foreground to reflect the camouflage of the crab, nothing in the background so that was black to make the candy crab stand out, as well as lighting up the soft coral to bring out the details. I would like to emphasise the not stressing of the candy crab as it would have quickly moved to an unfavourable part of the soft coral where I would not have been able to get this shot, rather than remain around the ideal location. I was then able to wait for it to slowly move into the perfect position, focus and take the photo then wait. That is probably the most important point to make!